In a speech recently, I was asked, “Why don’t we just focus on the positives and forget the negatives? I don’t like to think about the negatives so I think we should just focus on the good things that we do and try to do them better.” Well, that sounds good but the problem is that it doesn’t work very well. For one, it tends to make us one sided. It’s a lot like working out with weights only on one side of your body. For sure, you will look good on that side but what a sight you would be if someone ever saw the “whole you”. Let’s say that you are really good at throwing a baseball, so good that you make it to the pros and become a superstar. Let’s also say that you make so much money throwing a baseball that you are about as risk free as a person can be. But you have this other side—a side that others don’t see that much and you don’t really want others to see it. Let’s say that side is tied to your ability to control your temper. Now we have a problem. The reason we have a problem is that we know people/pitchers like that. They are incredible at what they do and they are icons in their field. You see their names in the sports pages and financial pages a lot. You know them but you never really get to see them because they are rarely ever seen. Yet they are known to everyone. They are people with a few personal constraints. 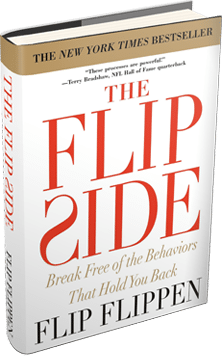 When we wrote our book, The Flip Side, in regard to the fifth Law of Personal Constraints, our editor kept correcting our wording. The “Law” was “Those with the least personal constraints…..WIN!” They kept changing least to fewest because that was more grammatically correct. Problem was that wording is also behaviorally incorrect. It’s not the fewest but the least. It’s not the number of personal constraints but the amount of overall impact of the personal constraints that determines the significance. If you only have one personal constraint then you might have the fewest, but what if that constraint is that you destroy people due to your temper being uncontrolled…now, we have a problem.